Tópico em 'Mangás, Light novels & Visual novels' criado por rapier em 10/12/2013, 21:39. 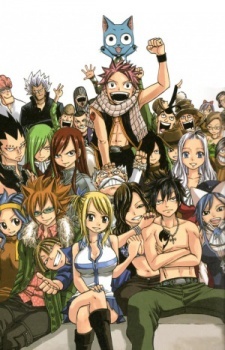 Sinopse Manga Updates: Celestial wizard Lucy wants to join the Fairy Tail, a guild for the most powerful wizards. But instead, her ambitions land her in the clutches of a gang of unsavory pirates led by a devious magician. Her only hope is Natsu, a strange boy she happens to meet on her travels. Natsu's not your typical hero - but he just might be Lucy's best hope. Note: Won the 33rd Kodansha Manga Award for Best Shounen Manga. Won the Society for the Promotion of Japanese Animation's Industry Award for Best Comedy Manga in 2009. Vol. 9 was nominated in the Youth Selection category at the 2010 Angoulême International Comics Festival. Acho que ele quis dizer Levy ao invés da mira... ou então o Gajeel tá passando o rodo. Se tem uma coisa que o autor faz bem nesse mangá, é desenhar donas boas. Eu li que o anime iria voltar, mas não achei nenhuma informação quanto a data. Sim vai voltar.. Em abril de 2014, e com um novo estudio segundo as noticias publicadas..